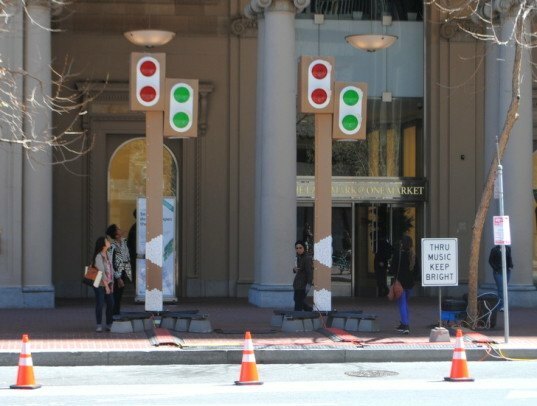 San Francisco recently played host to a 3-day explosion of interactive street art and urban designs installed along Market Street, a major boulevard through the city's downtown. 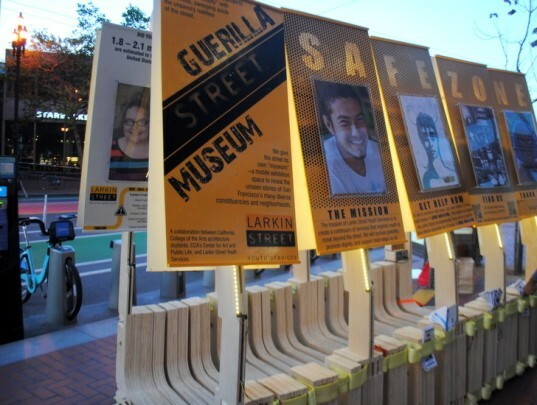 The Market Street Prototyping Festival featured dozens of unique temporary installations that allowed designers to get instant feedback on their creations and determine what designs might have potential as permanent installations in the city. 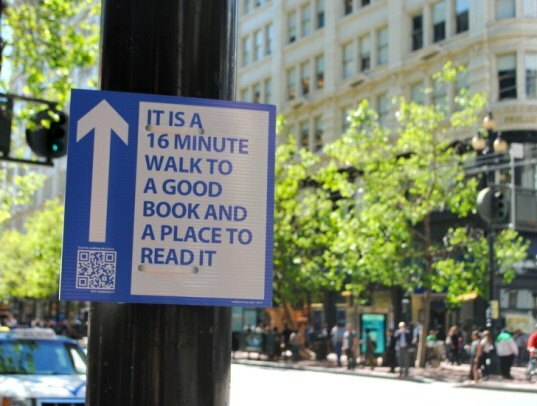 At the same time, it provided visitors with plenty of ways to relax, interact and experience groundbreaking art in the heart of the city. 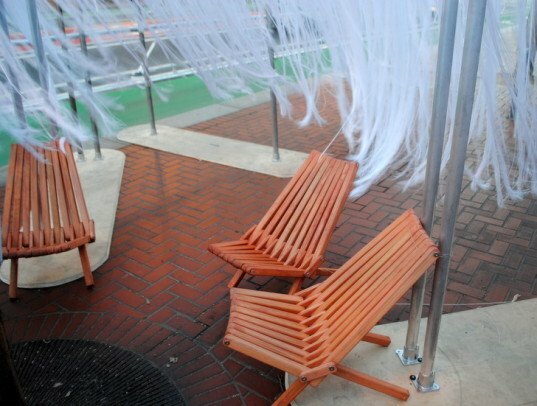 The “Market Street Prototyping Festival” featured dozens of unique temporary installations — like the “Bench-Go-Round” above – created by designers, architects, students, community members, artists, and others who entered their concepts in an earlier call for submissions. 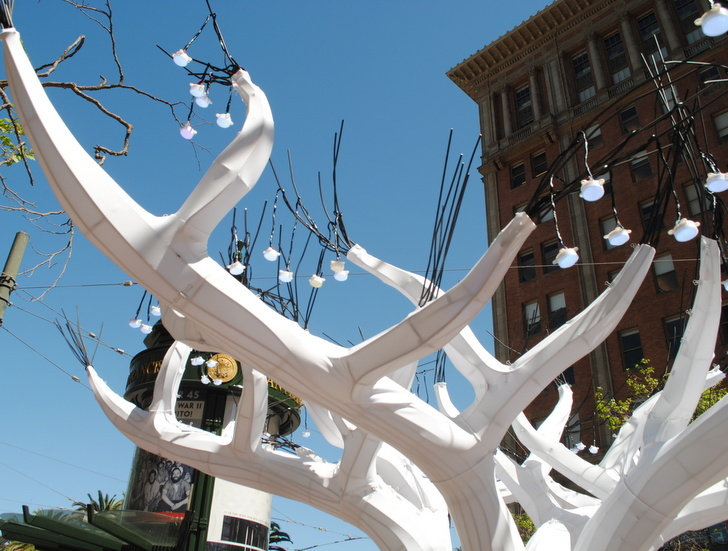 The San Francisco Planning Department partnered with the Knight Foundation and the Yerba Buena Center For The Arts to present the Prototyping Festival, which is part of a larger multi-agency effort to revitalize Market Street, a key downtown corridor. By installing low-cost prototypes instead of permanent structures, artists and organizers can get real-time feedback on how their designs work in the real world, what resonates with the public, and which improvements must be made. 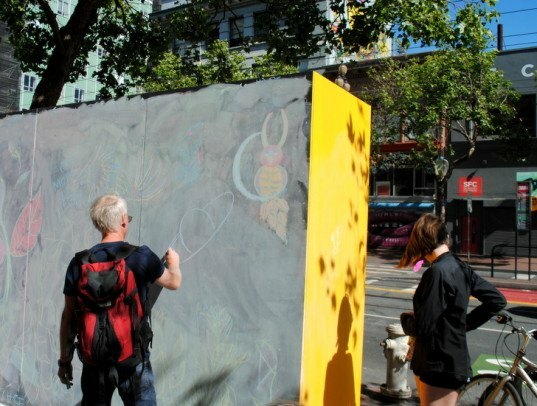 One of the most unique aspects of the Prototyping Festival is that after organizers have gathered feedback from the public, some of the prototypes may be formalized and installed on a more permanent basis along Market Street. The interactive displays create sense of place for Market Street, providing opportunities for play, learning, and exercise. City planners and designers from other cities across the US and the world were invited to participate and get inspired to create urban interventions in their own cities. 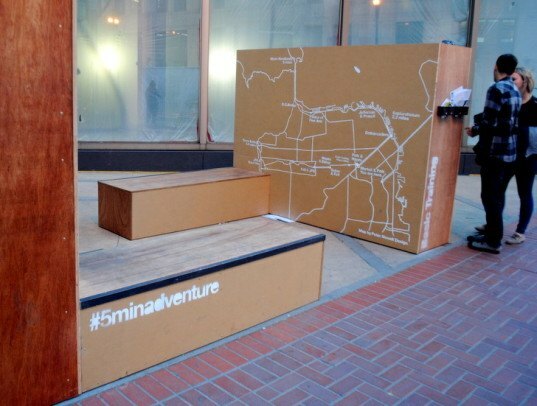 We walked through the five zones of the festival – spanning from San Francisco’s waterfront all the way to City Hall – and snapped some photos of the prototypes. Below, “Knock Stop Music” is a way for pedestrians across the street to interact with one another — by knocking on the faux stoplight posts, the stoplights across the street flash different designs while playing a whimsical tune controlled by the people on either side of the street. 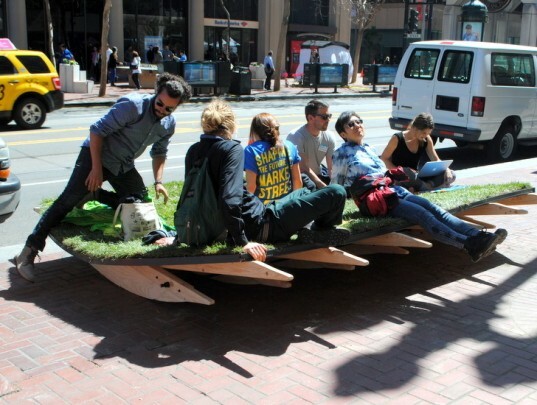 We saw this group of people relaxing on this oversized grass-covered rocker, intended to create a mini urban oasis and alternative seating option in busy downtown San Francisco. Walking along Market Street, we spotted the “bike counter”, which measures how many cyclists have traveled down the street on any given day. “Tag Tunnel” was created by a team of youth artists and designers, and features an exterior chalkboard wall and interior wall for street artists to paint on. 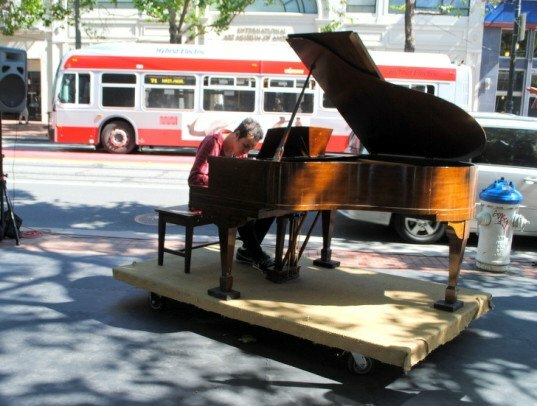 We were lucky to catch this performer playing a grand piano right on the sidewalk next to a busy street, only to see it whisked away moments later – “Show Box” is a sidewalk performance space and seating area that featured different music, theater, and dance events throughout the festival. “Fogplane” is an installation made of stretchy white fabric, emulating layers of San Francisco fog, inviting passersby to interact, stretch, play and hide in it. The “PPlanter” is a solution to public urination on downtown streets, that creates a temporary private enclosure and uses plants to bio-filter urine. “Tree Sitting” invites pedestrians to enter a walkway surrounded by swaying white fringe, leading to a street tree. The tree is surrounded with seating where visitors can look up at art inspired by tree-ring data, and find a temporary respite from the street. The “Tenderloin Exertrail” is an interactive workout setup where participants create their own customized workout using cross-fit techniques, intended for installation in dense urban areas lacking parks and opportunities for keeping fit. Festival-goers try out the “Ember” installation, where stumps are arranged in a “campfire” like arrangement. 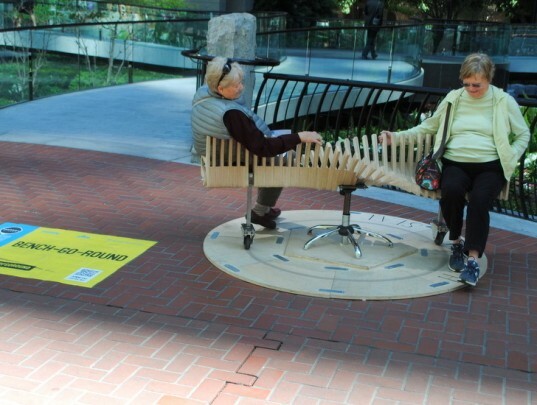 Once someone sits on a stump, it lights up and emits a sound, creating a melody based on when other users sat there. “Ghost Arroyos” aims to visually highlight historical creeks that once ran alongside Market Street. 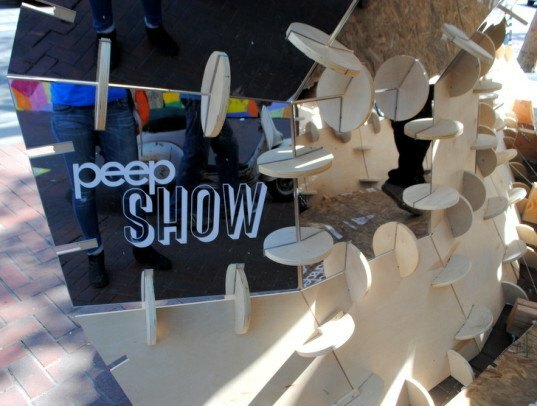 “Peep Show” is a mirrored interactive sculpture – pedestrians walk through, seeing fractured reflections of the street life around them. The “Play Everyday” installation is a fun interactive spot for passersby to “play” or work out, with a climbing wall and suggested workout routines. The "Market Street Prototyping Festival" featured dozens of unique temporary installations -- like the "Bench-Go-Round"-- created by designers, architects, students, community members, artists, and others who entered their concepts in an earlier call for submissions. 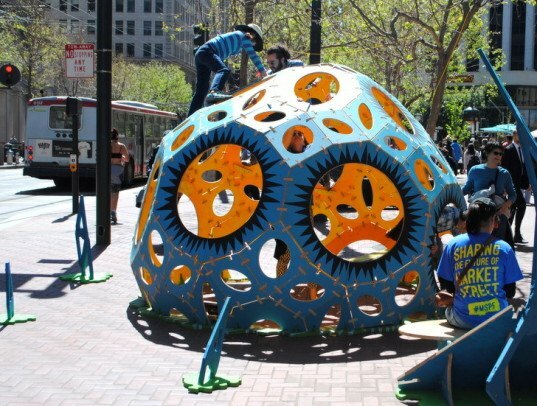 The San Francisco Planning Department partnered with the Knight Foundation and the Yerba Buena Center For The Arts to present the Prototyping Festival, which is just part of a larger multi-agency effort to revitalize a key downtown corridor. By installing low-cost prototypes instead of permanent structures, artists and organizers can get real-time feedback on how their designs work in the real world, what resonates with the public, and what improvements must be made. The interactive displays created sense of place for Market Street, providing opportunities for play, learning, and exercise. City planners and designers from other cities across the US and the world were invited to participate and get inspired on how they could create urban interventions in their own cities. We walked through the five zones of the festival - spanning from San Francisco's waterfront all the way to City Hall - and snapped some photos of the prototypes in use. 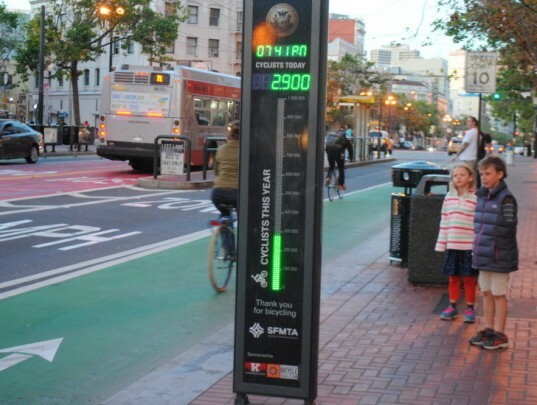 Walking along Market Street, we spotted the "bike counter", which measures how many cyclists have traveled down the street on any given day. 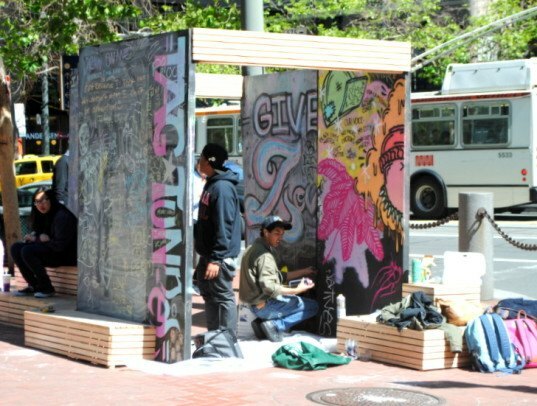 "Tag Tunnel" was created by a team of youth artists and designers, and features an exterior chalkboard wall and interior wall for street artists to paint on. We were lucky to catch this performer playing a grand piano right on the sidewalk next to a busy street, only to see it whisked away moments later - "Show Box" is a sidewalk performance space and seating area that featured different music, theater, and dance events throughout the festival. 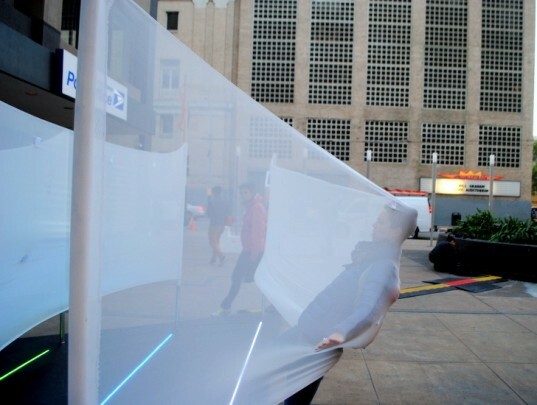 "Fogplane" is an installation made of stretchy white fabric, emulating layers of San Francisco fog, inviting passersby to interact, stretch, play and hide in it. 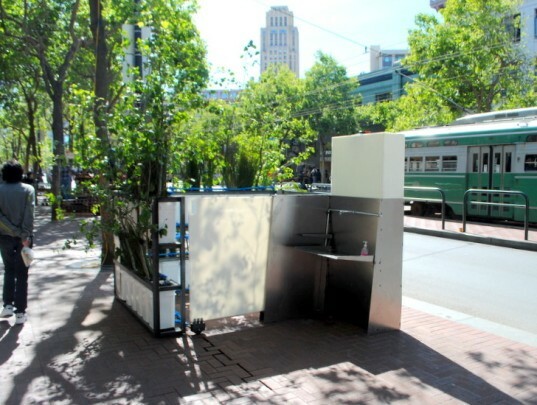 The "PPlanter" is a solution to public urination on downtown streets, that creates a temporary private enclosure and uses plants to bio-filter urine. "Tree Sitting" invites pedestrians to enter a walkway surrounded by swaying white fringe, leading to a street tree. The tree is surrounded with seating where visitors could look up at art inspired by tree-ring data, and find a temporary respite from the street. 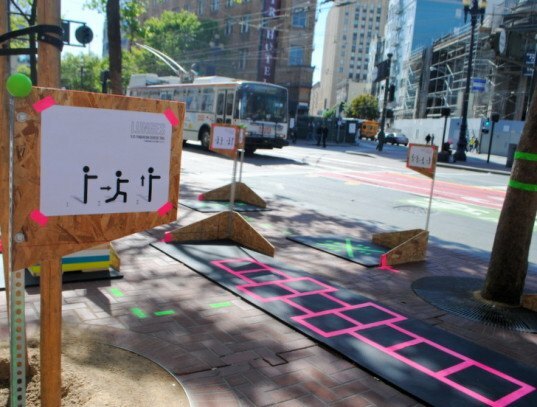 The "Tenderloin Exertrail" is an interactive workout setup where participants can create their own customized workout using cross-fit techniques, intended for installation in dense urban areas lacking parks and opportunities for keeping fit. Festival-goers check out the "Ember" installation, where stumps are arranged in a "campfire" like arrangement. 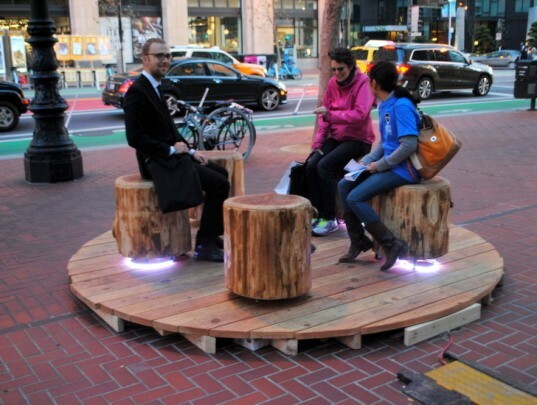 Once someone sits on a stump, it lights up and emits a sound, creating a melody based on when other users sat there. 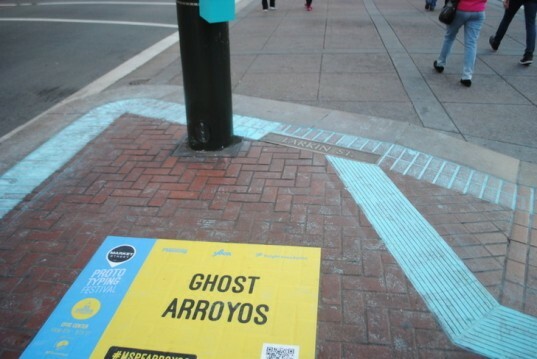 "Ghost Arroyos" aims to visually highlight historical creeks that once ran alongside Market Street. "Peep Show" is a mirrored interactive sculpture pedestrians can walk through - seeing fractured reflections of the street life around them. The "Play Everyday" installation is a fun interactive spot for passersby to "play" or work out, with a climbing wall and suggested workout routines.